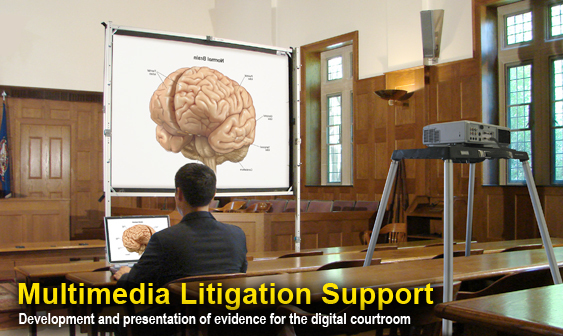 Development and presentation of evidence for the digital courtroom with the same excellent service and dependability for which MediVisuals is known. We can participate at the level of involvement you prefer throughout the entire process of your trial preparation. From the beginning, MediVisuals can help organize your presentation and create new slides and visuals while also reviewing case records to produce medical illustration exhibits and animations. During trial, we can work with you in the evenings to develop new slides for the next day in court. Or, if you simply want us to present what you have, we can do that, too. What can we do for you? A MediVisuals trial support team member will meet with you to discuss the case and collect any physical or digital files you would like to display. All files will be digitized and uploaded to the trial presentation software and assigned a number. We will create an indexed trial book with all the files printed with their corresponding numbers. During trial, all you have to do is call out the number and the operator will project that file onto the screen. MediVisuals will provide the necessary equipment with back-ups should they be needed. We will also contact the courthouse and get permission to use the equipment during trial. MediVisuals can create a slideshow presentation for your mediation or opening/closing statements. We will work with you to help develop the presentation and create any case specific slides that will help support your argument. During the presentation, you can either advance sequentially using a provided remote control or a MediVisuals operator can run it for you. With our service, you can call out a number or scan a barcode to have your exhibit on the screen instantly, at any time during the trial. Also, the number of exhibits you can have at your command is virtually unlimited. At over six feet wide, the jury will be able to read small text and appreciate other small, but important, details on your projected images. You can have the jury focus on a specific area by zooming in and/or highlighting an important area while an image is on the screen. Other annotations (e.g. arrows) can also be applied. In addition, a laser pointer will be supplied so you or your expert can identify certain areas of the images. From deposition videos of expert witnesses to 3D animations, all can be presented on the large display screen (with sound when applicable). A MediVisuals trial support team member will be right there with you to make sure the equipment runs smoothly. We can make quick changes during trial to most digital files, such as jury instructions and opening/closing statements, and even redact parts of an exhibit that may be unpublishable to the jury. Flipping large awkward note pads on tripods will be a thing of the past. All of your visual presentation components will be set up and ready for you. In addition, all digitized files can be saved to a CD or flash drive, which you can share with experts, opposing counsel, and clients. We are not just medical exhibits. We create charts, graphs, accident reconstructions, timelines, and other compelling visuals for your presentations. From scanning films and records to highlighting transcripts, let us take care of all your exhibit creation and presentation needs. If you have worked with MediVisuals before, you can expect the same quality service, products and dependability. If you have not worked with us before, come see why so many others do.